Learn how to legally bet on the Presidential Election and other Political events in the US. Legally betting on politics is one of those intriguing niches within the gambling industry, and unbeknownst to many bettors, political wagers can end up yielding a nice hefty payout if you place your bets right. As a larger range of people have become more politically aware and involved during the last two presidential elections, the bettor base has expanded exponentially. Based on this steady growth in legal politics betting, we decided to include this gambling platform as one of the topics covered in our guide. The irony of betting on the elections and events associated with those politicians attempting to outlaw gambling is not lost on the American people. However, it is still prudent to make sure you understand the legalities surrounding political betting, and what legally sanctioned options should really be considered. This guide will break down this data for you so that you can make highly informed decisions about your involvement in this type of entertainment based on accurate and up to date facts. Many players just want a simple explanation as to whether or not it is legal to bet on politics in the United States. The short answer is yes, betting political events online is legal in the US simply because there are no specific federal regulations that outlaw the act of online gambling. The repeal of PASPA has made things even more simple and we are likely to see both domestic and offshore legal political betting gain momentum. Bovada is our recommended sportsbook for betting on politics. Their lines are always competitive and comparable to the Las Vegas sportsbooks. Because Bovada caters almost exclusively to USA players, they put a lot of thought and work into creating a comprehensive range of betting lines and odds for those who enjoy betting on US politics. They also sometimes cover big elections in other countries. In addition, Bovada is a full-service online sportsbook and casino site. They basically offer everything under the sun all under one betting account. So whether you want to bet on the presidential election, an NFL game or play some online casino games, Bovada has you covered with the most robust software suite in the industry. They are also the most trusted site who has never missed a payout. So if trust and reputation are as important to you as it is to us, then Bovada is genuinely an excellent choice. The following is a list of the most reputable offshore betting sites in the industry. They pay out winnings just as fast if not faster than the US regulated options above and many of them offer some great ongoing promotions and bonuses for loyal players. Most of these sites don't offer wagering on Greyhounds for whatever reason, but they offer a full service sportsbook and horse racebook which gives players a lot more options for betting more than just the dogs. Is It Legal To Bet On Political Events In The US? Yes, there are legal options for betting on politics in the US. Political wagering is a segment of sports betting, therefore the laws governing sportsbook gambling also govern political wagering. In the Spring of 2018, the Profesional and Amateur Sports Protection Act was repealed, thereby removing the ban on sports betting expansion in the US. This also caused a modification of the application of the Federal Wire Act, which now only prohibits interstate betting, or accepting bets across state lines. There have not ever been any US federal gambling laws that made it a crime to place sports bets online at licensed offshore sportsbooks, but this dramatic change in the laws of the land has reshaped the legal landscape for political wagering in such a way that there are now no federal laws that prohibit either domestic of offshore political wagering. A handful of states have already embraced state-regulated sports betting, while others are in the process of doing so. No, political wagering might not be the first lines they get up and going, but it is probably only a matter of time before they follow the lead of the offshore sportsbooks offering political betting odds. 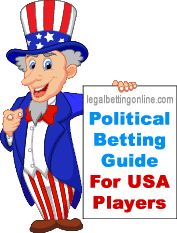 Until then, it is perfectly legal to place bets on US or foreign politics through the licensed and regulated sites listed in this guide. Our ballot measures by state guide is a resource where you can track gambling bills to see what changes are being voted on for gambling reform in your area. There are two states that prohibit online wagering of any kind regardless of the source, those being Washington state and Connecticut. While there is no evidence of enforcement of those restrictions, the fact remains that the laws are in place. We do not condone or encourage illegal gambling in any circumstance. Even though the presidential election sees the most betting action every four years, political prop bets provide bettors a way to cash the odds of that a politician will or won’t do something, and sportsbooks frequently post a variety of entertaining novelty prop bets during the lull in between election seasons. The next US Presidential election will take place on November 3, 2020. Any election that involves Donald Trump will probably see a lot of drama and controversy due to the nature of his performance and public approval and disapproval. This far ahead of the game it is, of course, impossible to predict what will happen, which is why the payouts are so nice for the futures odds on this election. Once candidates start officially putting their hat in the ring to run for president in 2020, the odds and markets will start to firm up and realistic outlooks will begin to emerge. If there's one thing the 2016 election taught us, its that ANYTHING can happen. Betting odds taken from Betonline Sportsbook and are updated automatically so they are always current. 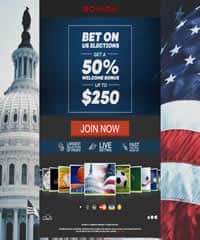 Betonline offers the biggest signup bonus for new players (50% bonus up to $2,500) looking to place future bets on the 2020 Presidential election and are one of the most reputable sites that still cater to American players. As you might imagine, the big bet here boils down to the big office. Who will win the Presidency is always the biggest betting line. And you can often find more than just a winner-loser dichotomy; you can actually bet on electoral vs. popular votes, winning percentages (like point spreads), and other variations in a single 1 vs. 1 election. Though you can also find betting lines on entire parties. For instance, the recent 2018 Midterm Elections had Republicans favored to take both houses of Congress, which they did. The next midterms may be reversed. From a local standpoint, gubernatorial and even council member races are always hot-button items on the betting circuit. You can find a range of different political events and elections on which to bet. You can also find prop bets, which will include things like the gender of the winner, the party of the winner, a clean win vs. a run-off/recount, and even bets about legislation like health care or immigration. Prop bets also include events such as debates. If it's part of politics, then there's undoubtedly a sportsbook out there with a betting line on it. Once the lines and odds start surfacing, we will provide examples here. To monitor it yourself, visit one of the sportsbooks listed above for current odds. Odds for winning the 2020 Presidential Primary – this type of betting line will allow you to bet on who will win the nominations in the primary for each party. If you are participating early in the process and are placing a futures bet, your range of options may include individuals who have not yet announced their candidacy but that are active in the political landscape and are considered potential candidates. The closer you get to the actual election, the more accurate your list of options may be. However, keep in mind that the futures bets can pay off big if you guess correctly. Odds for the gender balance on the 2020 Presidential Tickets – this line is sometimes broken down by party affiliation, but not always. Odds On Who Will Be Selected As The Republican Vice President – These odds are no longer available. Update: It was announced that Mike Pence was chosen as the GOP Vice President nominee on Friday, July 15th. Odds On Who Will Be Selected As The Democratic Vice President These odds are no longer available. Update: Hillary selected Tim Kaine as her vice president nominee. Odds For Winning a Specific State – This type of betting line predicts the winner of influential swing states. For example, the Iowa Caucus odds start surfacing very early in the race. Other states are added closer to the actual election. Winning the electoral votes in an influential state can make or break the election, hence these betting lines are particularly exciting and can determine the outcome of the election. The results of swing state Electoral College votes can be unpredictable, as we saw in 2012 when Obama took Florida despite the fact that Romney was the favored candidate to win the Sunshine State. Odds For Winning the Popular Vote – Once the candidates have been selected, you will find more betting types added to the line up, such as betting on who will win the popular vote. Though it has no bearing on the overall election, political aficionados enjoy betting on who will win the popular vote. There are times when the winner of the popular vote is not elected as President. The popular vote can be unpredictable, making it a very exciting wagering option. This type of option typically does not appear in the lines until about a month or two out from the actual election. Electoral College Count - You will find that your range of wagering options for these lines increases after the candidates are selected and the election is approaching. This is when additional prop bets and specific options appear, such as over/under wagers for betting on the Electoral Vote count. In this type of political betting line you are predicting whether a candidate will receive more or less Electoral College votes than predicted. Prop Bets - Some of the sportsbooks now offer some interesting prop bets for the election. At Betonline they offer some matchups that work similar to a quinella in horse racing. For example the first one on the sheet is Jeb Bush/Hillary Clinton matchup at +2200. That basically means that if you bet $100, you would win $2200 if those are the 2 primary candidates in the 2020 presidential election. There are some other interesting props such as Bernie plus the field at +500. So if Bernie is the Democratic nominee, $100 wins you $500. One of the most amazing things about President Barack Obama's election in 2008 was that no one had really heard of the man in 2007. A junior Senator with an iffy record of no-votes and voting "present" on big issues, even those getting to know him didn't think he had the political chops. However, democracy proved what democracy is, in that experience counts for next to nothing when you're a popular, charismatic figure. The people spoke, the people voted, and President Obama is almost finished with his second term in office. Who actually saw that coming? Very, very few saw it coming. But for those who did, they may have cleaned up tremendously by betting on Obama. The beautiful irony here is that it's actually politicians who seek to make gambling illegal across the nation, yet one of the most lucrative lines of betting is to wager on their elections and futures. Some may consider that to be very fitting, given the duplicitous, snake-like nature of many of these political buffoons. But we're not out to play politics. Republican or Democrat, liberal or conservative, socialist or libertarian, it matters not. It's all about the gambling here, and we'll take a closer look at political betting for all interested parties. Compartmentalization is a word you may often hear, but you may not really know what it means. Well, put it this way: You can absolutely loathe the political process, yet you may still find a way to make money by gambling on politicians. Don't worry; this isn't cognitive dissonance. This is simple math. Money spends better than hatred. Now, of course, there are plenty of reasons to despise politics. People who aren't even as smart as you, yet they stand on a podium, lie to the masses, and earn hundreds of thousands of dollars a year in salary and benefits. Heck, when a politician retires, they earn a pension package that's probably higher than your salary, and they could have been a horrible politician. It's no wonder Congress has such low approval ratings. The average person despises politics. But keep in mind that a government is something you're stuck with. Death and taxes, they say, and a savvy politician will even tax your death! How's that for control? There's just no shaking government; it's a monolith that's always with us. So, as the old adage suggests, one must laugh to keep from crying. Betting on politicians' fates can actually lighten you on the subject. You can learn to love gambling while still hating the political process.